TV star trains have delighted model railway fans in Bognor Regis. 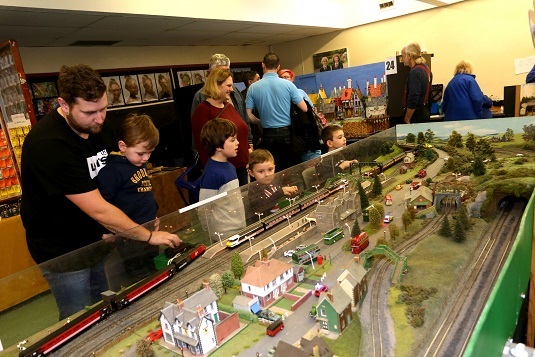 The layout by the Basingtoke & North Hants Model Railway Society was among the 16 displays on show in the town’s latest annual exhibition of the mini-marvels. The society’s members, aka The Basingstoke Bodgers, won their heat in episode three of Channel 5’s Great Model Railway Challenge series just before Christmas to reach the final. One of the modellers involved, John Smerdon, said: “We have a lot of recognition of the layout. A lot of people saw the programmes. “They did a lot of good for the world of railway modelling. Exhibitions are seeing more people going along and model train sets are said to be flying off the shelves because there is so much interest in them. The layout features a globetrotting Santa and involved skills such as artistry, carpentry and engineering common to all the 16 layouts in the event held by Bognor Regis Model Railway Club last weekend at Felpham Community College. Exhibition manager Mark Gallant said he was hopeful the display would attract some 1,000 visitors. “There is definitely a buzz about model railways at the moment. The TV series has inspired a lot of people to think about it as a hobby. “It has also shown children that it has kept up with the times. There’s a layout here controlled by iPhones and with sound effects. One display which was the subject of an article in Model Rail was the club’s Pines Railway with its two three-level spirals. One of the four members who built it, Richard Hance, said: “We have had fantastic interest because it is so different. “This is the first time the club has shown a layout with spirals and probably the first time one has been seen at this exhibition. The N gauge layout – measuring 7ft 9in x 2ft – was completed last September after 10 months. Another featured layout on its first visit to the exhibition was Lemmington Park by the Western Model Railway Society of Acton in London. The HO-gauge layout depicted a station in the outskirts of Chicago being served by the Chicago Rock Island Line. Western member Ron Bailes said: “There are a lot of different skills involved in building a layout. There is a lot of co-ordination using tools with your hands. On the adjoining stand were five entries, two by junior members, of a creative challenge by Bognor Regis Model Railway Club to build a layout in a cake box. One of the adult entries, by Philip Pilcher, depicted the early days of steam with pioneering engineer Richard Trevithick and his Steam Circus in 1808. Mr Pilcher said: “I thought that if I was going to turn the clock back I would turn it right back. I finished the layout at midnight on Friday. The winner of the club’s annual Maxted Award for the layout chosen by the town mayor, Cllr Stephen Reynolds, was Charlie Fox-Wilson, for Rainbow Rock. This colourful G-gauge display was based on the work of 1950s cartoonist Emmett and showed rainbow rock being transported to a sweet factory. Mr Fox-Wilson, pictured right, said: “It’s very nice to win the award. This is the first time I’ve shown the layout.